It is the design of your study that will give it credence in the wider scientific community. If it is clear from the dissemination of the study that there has not been a clear hypothesis, endpoints are inappropriate and the study design inadequate, then it is unlikely that the outcome of the study will be used to contribute to the process of regulatory approval, or form part of a meta-analysis. It is important to get the design right from the start. The time taken will be well worth it. 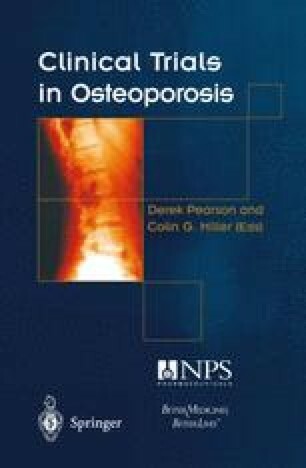 Guidelines for the Preclinical and Clinical Evaluation of Agents used in the Prevention or Treatment of Postmenopausal Osteoporosis. FDA, 1994 (http://www.fda.gov/cder/guidance/osteo.pdf). Notes for Guidance on Postmenopausal Osteoporosis in Women. Committee for Proprietary Medicinal Products (CPMP), 2001 (http://www.emea.eu.int/pdfs/human/ewp/055295en.pdf). ICH Harmonized Tripartite Guideline E6 Good Clinical Practice: Consolidated Guidance (http://www.fda.gov/cder/guidance/959fnl.pdf).